These section of pages is not just about what is a computer, but it's about general what is questions that people frequently ask me. I frequently get questions such as, "What is RAM" or "What is a BIOS" or "What is memory" and so forth. So, I decided to create some pages that try to answer all that, "What is" questions. For a complete list of "What is" questions, see the bottom of the page for more information. So, the first question I sometimes get is, What is a Computer?. The answer may seem pretty straight forward, and it should actually be pretty straightforward, but there's more to a computer than just circuits and switches. If you think about a computer, you immediately think about a desktop or laptop PC. The screen, keyboard and case setup. 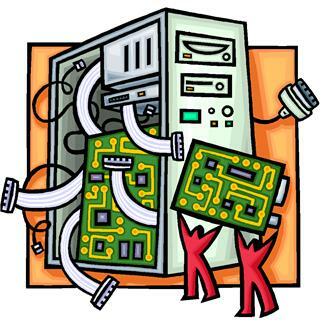 Internal you have a motherboard with CPU, memory and hard disk running some operating system such as Windows or Linux. This might be true, but what is a computer actually. What does it do. Why is it called a computer? A computer is a device that takes input, processes this input and produces some kind of output. Doesn't a blender do the same?, you might ask. You input fruits or veggies into the blender, the blender then processes this input and produces output, in the form of a juice. Remember there's no intelligence. The blender just mashes the food. That's all it does. You cannot tell it to create an ice cream or calculate something. That's where computers shine. They can do complicated and mundane tasks quickly and easily. Faster than human beings can and very accurately. Not all computers are digital or works with circuits and transistors. Take the flight computer, for instance. I remember when I did my private pilot license I received this complicated piece of cardboard with lots numbers and dials. Trainee pilots used to call it a "Flight confuser". If you work with it you'll know what I mean. 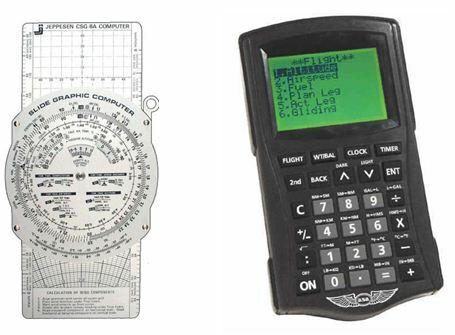 Flight schools still use this paper based computer to calculate fuel load and air-density and a whole host of other stuff. The reason why pilots still use it is that it does not need batteries. It turns and slides and this info is then used to calculate different values. There is also a small digital version of this computer. Pilots has since adopted this digital version instead using the paper based one. Below is a picture of the two versions. As you can see the paper based version of this computer looks quite complicated, but once you have worked with it a bit, it gets easier to use. The reason why it looks so complicated is that all settings and numbers has to be clearly displayed. By that I mean ALL numbers and settings. With the digital version you can put all this information on a computer chip, which is the size of your fingernail. There are hundreds, if not thousands, of places you'll find a computer, and they all process, input and output. The more traditional computer, like we know it, consists of CPU, memory, disk and network built in a thing called a computer case. It has a keyboard, mouse and screen for input and output, although this is not the only methods for input and output. The CPU loads a program in memory and then processes the data. Files get loaded and saved to hard disk, output is generated and displayed and printed. When people ask, "What is a Computer" the traditional PC or laptop always comes to mind, but there actually more to a computer than just circuits and transistors. 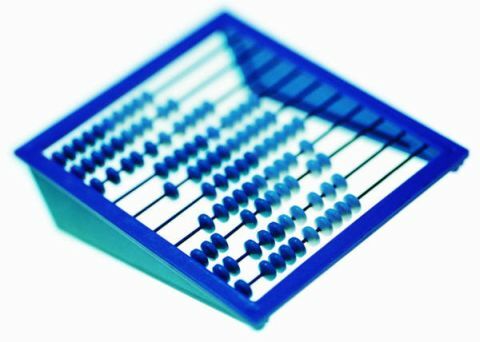 Have ever thought of an abacus? That's also a computer. You can use to count, or it can help you to remember what you have counted. So, I would say yes, even the humble little abacus is definitely, also a computer. You move the little beads around and this helps you count or remember what you have counted. Bet you never thought an abacus could be computer, hey. So, what is a computer? It's a computing device that helps us in our daily lives. We have become so attached to them that I cannot imagine our lives without it. Then again, 50 or so years ago people did not have computers. They did not have mobile phones or calculators to help them in their daily lives. People believe that in 2012 a huge solar flare will destroy all electronic devices on earth, and we will go back to a time before electronics. Will we survive? Of course we will, but I think people who are dependent on their phones and iPad's might just go bonkers. Learn more about this very important protection device. What is a Mainframe Computer? Read more about study of computers. You don't need to be a rocket scientist. Read more about how to simplify your printing setup. Learn more about computer networks and how to build them.